Best turntable hi-fi system for £3000 | What Hi-Fi? There's still something about the act of playing a record that still feels like hi-fi nirvana. The tiny, explosive pops and rustling crackles, the delicate operation of placing the needle on the groove, the way the black vinyl catches the light when spinning – they bring about the rose-tinted nostalgia in all of us, whether you’ve owned a turntable system before or not. The Rega RP6/Exact has been one of our favourite turntables for years, and the superb Elex-R works so seamlessly with it we wouldn’t dream of separating them. 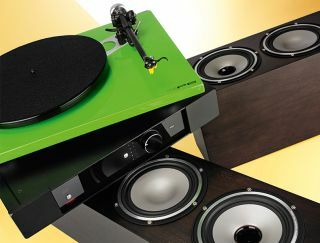 This Rega combination is so good, we kept auditioning speakers with them until we hit the right pair. It’s not that the speakers weren’t any good (they’re all five stars), but it’s just finding that one pair that sounds just right. For instance, the B&W 685 S2s sounded rich but bottom-heavy with the Regas; Dali Zensor 3s were lively, but we wanted greater subtlety; the agile and attacking Triangle EZs nearly got the job until we realised their excitable treble wouldn’t always play nicely with the Rega’s slightly lean character. And then we heard the Tannoy Revolution XT6Fs, and we had our system. These floorstanders – apart from having the obvious advantages in delivering a large scale of sound and being able to hit bass notes while maintaining an articulate, enthusiastic performance – are ridiculously good speakers for their price. We start off by spinning Nirvana’s Nevermind and as the first strains of Smells Like Teen Spirit kick in, we know we’ve got a brilliant system on our hands. The classic early-1990s grunge anthem bursts forward with punchy detail, angry strumming and drums that hit with so much impact they are actually felt more than heard. The Regas are terrifically musical and agile, and they zip through the charging rhythm with sheer enthusiasm. They handle all the rhythm changes with accuracy too. The stop and start of notes are incredibly precise, and the abrupt changes in tempo and dynamics are delivered effortlessly thanks to the nimble and versatile Tannoy speakers. Kurt Cobain’s voice is all gravel and hoarseness, and the Rega/Tannoy system doesn’t flinch from delivering the full aggression of the vocals as the song reaches its crescendo. It’s an attention-grabbing system from the off. The Regas are guilty of a slightly lean character, but there’s no brightness in sight. The system also doesn’t lack the grunt and depth in the low frequencies – basslines are ferociously taut and punchy. Couple the Regas’ authoritative tone with the Tannoy’s immense sense of scale and you have the kind of solid, articulate and spacious sound that’s unrivalled at this price. Switch to the more soulful, melodic tones of Dusty Springfield’s Spooky and you’ll be swept away by how raw and intimate her voice sounds. Despite the occasional crackles and pops littered throughout the recording, the sound is incredibly clear and forthright. Once again, it’s that effortlessly fluid character that captivates us – you’ll forget just how hard the Tannoys and Regas are working when the music sounds so good. This is one good-looking system, and we can’t deny the glossy finish of the RP6 looks utterly desirable. Officially, it comes in the standard red, black and white, but other colours are also available, including our review sample’s eye-catching bright green. The finish is excellent, and everything from the RP6’s platter to the tonearm is built to the highest standard. Rega continues its good form with the Elex-R. Build quality is impossible to fault, with a sturdy metal chassis that some may call functional – but we’d rather label 'understated'. The red indicator lights contrast nicely against the hulking mass of black, while the buttons click satisfyingly when pressed. The remote that comes as standard doesn’t quite have the same authoritative design, but the controls are simple and work intuitively with the amp. Response is swift and smooth. Completing the picture (and sound) is a pair of classy looking Tannoy floorstanders. They’re tall, but the trapezoid shape, while crucial in eliminating internal standing waves, also keeps them slim enough that they don’t dominate the room. Tannoy’s Dual Concentric driver looks striking as always, and finish is pretty much perfect. We like the little design flourishes such as all the exposed bolts having ‘TANNOY’ etched on them – all these touches add up and show just how much care and attention has gone into constructing these speakers. The XT6Fs are available in either dark walnut or medium oak finishes. This is one system where you’ll really want to take time and care when setting up. Don’t be afraid to get nerdy here, either. The RP6 has no suspension, apart from three non-adjustable rubber feet, so make sure the support is level (tip: use a spirit level for this), has low resonance and is solid. The key is to keep the turntable as still, flat and vibration-free as possible. Most of us don’t have a lot of flexibility in our living spaces, but if you can, position the turntable far away from the speakers to avoid vibrations. To go one step further, install a wall stand for even greater isolation. If you’ve never set up a turntable before, head to our YouTube video tutorial. You’ll need to know the tracking weight for the RP6’s Exact cartridge (it’s 1.75g), adjust the counterbalance so that the tonearm just floats on its own, and don’t forget to lock the tonearm in place when you’re not using it. The RP6 comes with its own power supply, too. Once connected and assembled, plug the RP6 into the Elex-R’s rather excellent sounding phono stage (always input 1 on Rega amps). There are four other line level inputs for plugging in extra sources. You get the option to biwire or single-wire the Tannoy speakers. Once you’re set up, you’ll start obsessing about being able to position the needle precisely at the start of a track. See? This is the fun part of using a turntable. For those with a vast vinyl collection hidden away in the attic, now’s the time to get them down. Spinning your old 33s and 45s on this system will have you listening to records like you’ve never heard them before. Vinyl sales are at their highest in almost 20 years, and this revived interest in vinyl can only be a good thing. If this Rega/Tannoy combination is your first ever hi-fi system – you couldn’t pick a better way to start. It’s a gorgeous system.